49” Stainless Steel Whip – Extremely Efficient High “Q” Coil – 6 Gauge Solid Copper 100% Silver Plate Wire Stryker takes pride to introduce its phenomenal CB antenna called Stryker SR-A10. The New Stryker SR-A10 is inspired by the US Air Force Thunderbolt II affectionately nicknamed “The Warthog,”. The Warthog is renowned for its extreme durability and lethality, thanks to the 30mm Gatling gun. The SR-A10s bold styling leaves little doubt that it can take care of business, and it will! Durability is maximized because SR-A10 antenna uses a double walled coil cover to protect it from the elements; no one else offers this. These two layers of high impact mobay thermoplastic can absorb a tremendous amount of abuse. The top and bottom covers are sealed with special o-rings to prevent water from reaching the coil. Bigger in performance it’s guaranteed If you are wondering what makes the A10 any better than your current CB antenna, it is the coil. The heart of the antenna is the extremely efficient air-wound coil; making performance exceptional. This coil is wound with 6 gauge solid copper wire that is 100% plated in pure silver; this makes the coil highly conductive. The SR-A10s design results in significantly less static receive noise. Trust us; your ears will not miss it! Shell is doubled means coil is SAFE Open coil antennas and there are many, look neat, but a dirty coil reduces performance properties of the antenna, ice or snow can cut performance in half. Thanks to the double wall coil cover, you never have to worry about that on the SR-A10. To offer a high-performance trucker antenna that’s tough enough to withstand daily abuse on a truck. Moreover, corrosion will stay far away from it where you will find the ordinary antenna withering off gradually because of that layer of rust. 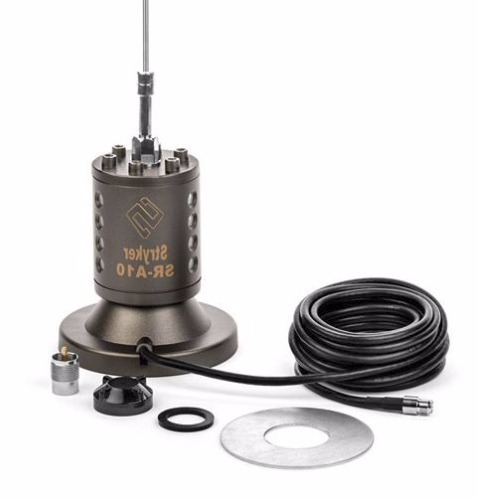 Higher “Q” value, for greater efficiency Manufacturers have ensured quality in every aspect of this unique cb antenna. The coil was designed for a high “Q”. The higher the “Q”, the greater efficiency, meaning it is a higher performance antenna all over the market. This antenna is capable of carrying your talk safely over long ranges and can also receive the incoming signals with the clarity that your will not miss it. We did not spare any expense in the design and construction of this antenna. Why buy a top of the line radio and choke its performance with cheap antennas? Quality and Performance cost a little more, but the results more than make up for it. Regardless of performance, cheaply made antennas do not hold up to the elements and can end up costing you more in the long run. Stop wasting your time replacing and tuning antennas that aren’t up to the task. The SR-A10 comes with a two-year warranty and is built to handle the use and abuse that you encounter daily. Buy with confidence, You will not be disappointed.